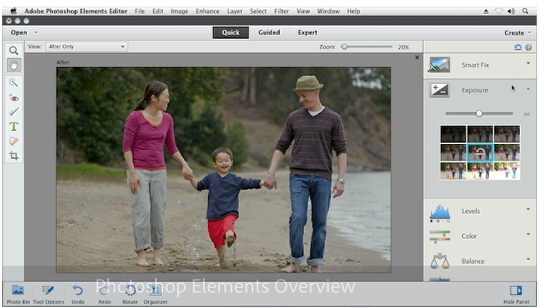 Adobe today announced the availability of Adobe® Photoshop Elements 12 and Adobe Premiere Elements 12. Customers will enjoy powerful mobile capabilities, and reap the benefits of professional-grade editing technology delivered in an intuitive experience that makes it easy to create stunning results. · Mobile Access – With Elements Mobile Albums, customers always have access to their precious memories. Powered by Adobe Revel, people can view, edit and share their photos and videos seamlessly on their smartphones, tablets and desktop devices whether at home or on-the-go. · Content-Aware Move – This exclusive Adobe technology lets customers easily move objects within a photo and automatically fills in resulting empty spaces. · Pet Eye Correction – Added in response to customer requests, Pet Eye provides an easy solution to the problem of flash reflection in animals’ eyes, which is not addressed by Red Eye correction technology. · Auto Smart Tone – Exclusive intelligent software that learns a customer’s editing preferences, resulting in one-click adjustments based on their choices, which gets better the more you use it. · Quick Frames, Effects and Textures – One-click photo frames, effects and textures, inspired by the most popular looks customers have been creating in Expert mode. · Guided Edits – Step-by-step instructions to create Zoom Burst and Photo Puzzle effects, as well as Restore Old Photo, which enable users to restore damaged or old photos. · Straighten Tool – Now fills in missing edges through the use of exclusive Content-Aware technology. · Share to Twitter – Share a photo with via Twitter. · 64-bit support for Mac – Allows for more efficient use of your computers’ built in memory, maximising performance and enabling larger image files and videos to be edited quickly. Adobe Photoshop Elements 12 and Adobe Premiere Elements 12 (Mac and Windows) are immediately available for purchase at www.adobe.com/uk/ for £78.15, with upgrade pricing of £63.49. The Photoshop Elements 12 & Premiere Elements 12 bundle is available now for £117.22, with upgrade pricing of £96.71. Or in the US Adobe Photoshop Elements 12 and Adobe Premiere Elements 12 each costing $99.99, or $79.99 when upgrading from an earlier incarnation. The software is also being offered as a bundle, so those buying both will pay $149.99, or $119.99 on an upgrade. Information about other language versions, as well as pricing, upgrade and support policies is available at www.adobe.com/uk. For free training videos visit Adobe Photoshop Elements at http://tv.adobe.com/product/photoshop-elements or Adobe Premiere Elements at http://tv.adobe.com/product/premiere-express/#.